The people have declared 2019 the #Year4Housing! With knowledge that our man-made housing crisis can have man-made solutions, voters elected into office affordable housing advocates and leaders who are guiding city, county and statewide action through policies and housing dollars that tackle the issues of homelessness, long commutes and housing scarcity for the missing middle. Affordable housing developers working in tandem with city councils, national programs and state legislators, are creating more housing opportunities for low- and middle-income families, public employees, students, agricultural workers, seniors, veterans, and households otherwise at risk of displacement or homelessness. Spring is the season for affordable housing outreach and education. In Northern California, Affordable Housing Month 2019 is the perfect opportunity to learn more, get involved, and invite your friends and family to join the affordable housing discussion. Weekly events provide opportunities to everyone – civic leaders, corporate teams, government staff, elected officials, the general public, local neighbors and community members – to understand our current housing challenges and identify opportunities for solutions. Join together with affordable housing supporters and advocates to make progress for #affordablehousing #homes4all! This #AffordableHousingMonth, it’s time to deepen our work. 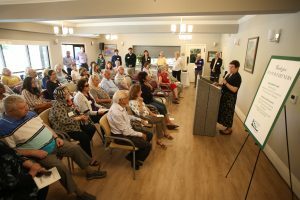 Different regions celebrated Affordable Housing Week last year as an educational and community building opportunity for advocates, government, practitioners and the general public. This year, join the events and tours as our advocacy partners host a month of festivities and educational opportunities highlighting the design, operation and partnerships that lead to thriving affordable housing communities. Festivities and events are around town throughout the month of May! Affordable Housing Week: Working together to create more opportunities for all! Housing Leadership Council of San Mateo County works with communities and their leaders to produce and preserve quality affordable homes. Join us for a week-long celebration of affordable housing and effort to bring our diverse community together to raise awareness, educate, engage, activate, and unite around affordable housing issues and how we can work together to make Santa Clara County a more affordable place to live for all of our residents. Each year’s this is an opportunity to emphasize the need for collective action and unification around the idea that everyone should have access to a safe, stable, and affordable home. Get ready for a week of grand openings, panel discussions, community events, tours, workshops, and more. It’s also the time when EBHO launches its Affordable Housing Guidebook.